A friend told us today about an NPR story of interest. At the United States Holocaust Memorial Museum, General David Petraeus honored veterans who helped to liberate the Nazi concentration camps. 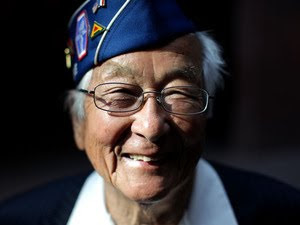 One vet interviewed for the story is Susumu Ito, who as part of the 552nd Field Artillery Battalion, attached to the 442nd Regimental Combat Team, came upon prisoners walking out of the Dachau concentration camp. In 1998, Densho interviewed Sus Ito, who went on to become a professor at Harvard medical school. He describes going to see his parents, who were confined at the Rohwer, Arkansas, War Relocation Authority camp: "It was strange visiting my parents in a camp, to report to military police in uniform -- and they're in uniform as well -- getting a pass to see my parents." Strange, or ironic, indeed.